I am new to this site and new to the world of swords. I have received a samurai sword that my father brought back from China at the end of WWII. It has been in a closet untouched all these years . He was in the Army Signal Corp in the CBI theater. I have attached a photo of the inscription on the tang. I would appreciate any suggestions or direction in how to translate the inscription or determine if the sword is authentic. Could you post more pictures, the tang looks a bit strange to me, in that it almost has zero (surface)rust on it. Also the circles with x in them i have never seen before, possibly a hole that was never drilled? Some pictures of the blade itself, temperline (if visible), handle and scabbard would be usefull. Kanji is open to interpretation, so if you could post pictures of the blade it would be easier to determine the smith. If you want to know if the sword is authentic, it will help if you attach photos of the entire sword. A tang inscription alone cannot guarantee the sword is genuine. I agree, but it probably is a genuine mass produced gunto. The X stands for "suke"
Thank you for your responses. I have attached more pictures to aid in identification. The reason there was no rust on the tang is because I wiped it with some 0000 steel wool to get better look at script. Beginners stupidity I am afraid. I so appreciate hearing your comments and helpful suggestions. Thank you for the translation. I will explore that more. Again, whatever feedback you can provide based on these pictures I appreciate. 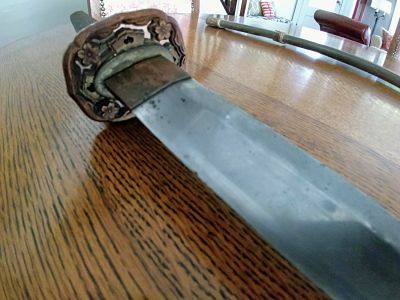 This sword is a part of our family lore regarding my father' s time in China during the war and in Shangai at the close of the war. The scabbard and fittings are standard WW2 issue called Gunto, I can't remember the exact type number of your fittings at the moment but others here could be more precise. This type was used from the late 1930s until 1943-4 in huge numbers for Japanese low to mid rank officers in the Army (higher ranks and naval officers had other types or variations); by the end of the war with materials shortages, new and cruder hilt types were being manufactured. If you took the wrap off the grip section, it would probably also be the WW2 fittings, and possibly still in good condition if it has been wrapped for a long time. I can't say much about the blade as katana aren't my speciality; blades were also mass-manufactured in WW2 and most are monosteel and of mediocre quality. 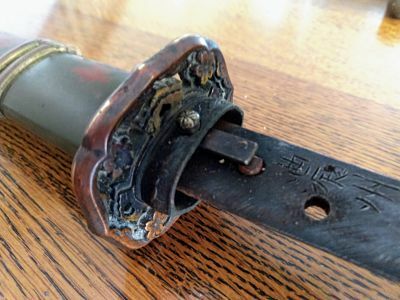 But sometimes old family blades were mounted with the gunto fittings, this meant the bits exposed to dings and scrapes in general wear weren't precious family heirlooms, but the blade was still of high quality; it is unlikely that this is the case with your sword, but the inscription translation will tell that story. Also, the blade is still in pretty good condition and not too badly marked, probably thanks to being stored in the scabbard all this time. It could be repolished, but that is a specialist job and expensive, so whether that is worth it depends on whether you want to all be original and with the patina that goes with real aging, and value vs polishing cost. If you look on eBay under "gunto" you will find a lot of complete swords, hilt sets, scabbards, and miscellaneous parts from dismantled swords, and you should be able to identify your exact component types from that (and get an idea of market value, if that matters to you - it will likely be worth a lot more to you as family history than the dollar value). Also use your Google-fu and search "Gunto", and you will find a lot of information about the history and patterns of military issue swords of the Japanese army. Thank you, Peter. Very helpful information to help me move forward.